In the first half of 2018, the eight most popular artists on interactive audio streaming platforms in the US were signed to (or affiliated with) Universal Music Group. According to Nielsen, they were (in order): Drake, Post Malone, XXXTentacion, Migos, J.Cole, Kendrick Lamar, The Weeknd and Kanye West. 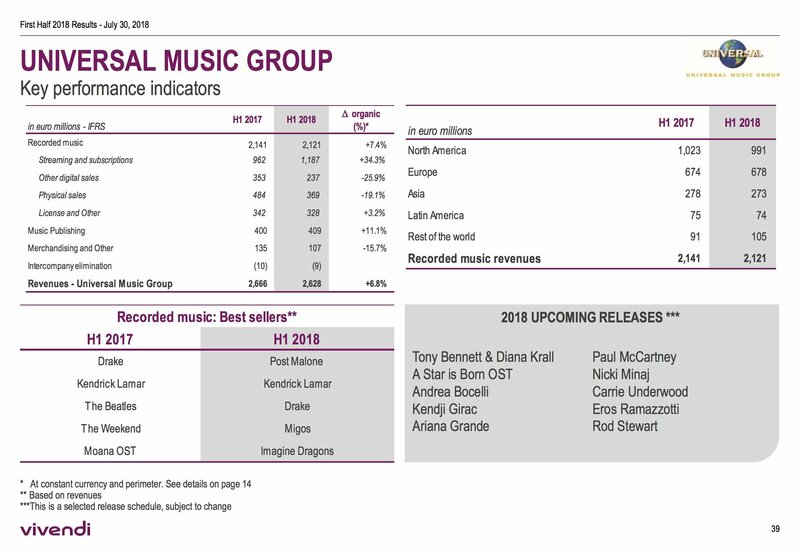 So it’s not a great surprise to see UMG’s recorded music financials reflecting a memorable six months for the company on Spotify, Apple Music, YouTube et al. 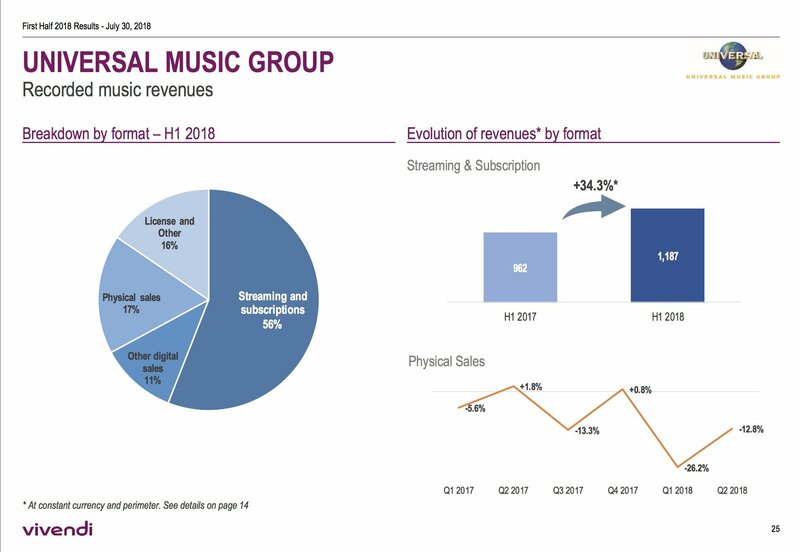 In the six months to end of June, UMG’s labels generated €1.19bn in revenues from streaming – up 34.3% year-on-year at constant currency. Elsewhere in H1 2018, Universal’s labels generated €369m ($447m) from physical formats, down 19.1% year-on-year at constant currency. Half-year downloads sales dropped 25.9% to €237m ($287m). Overall, Universal’s H1 2018 recorded music revenues rose 7.4% at the half-year point to €2.12bn ($2.57bn). The company’s biggest sellers in the period, on a revenue-generating basis, were: (i) Post Malone (pictured); (ii) Kendrick Lamar; (iii) Drake; (iv) Migos; and (v) Imagine Dragons. 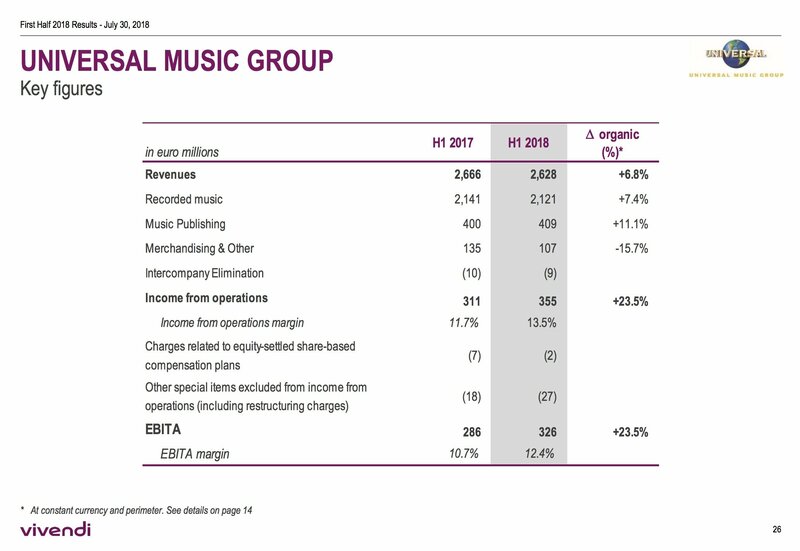 Including UMG’s music publishing operation and other activities, total H1 2018 group revenues rose 6.8% to €2.63bn ($3.18bn). 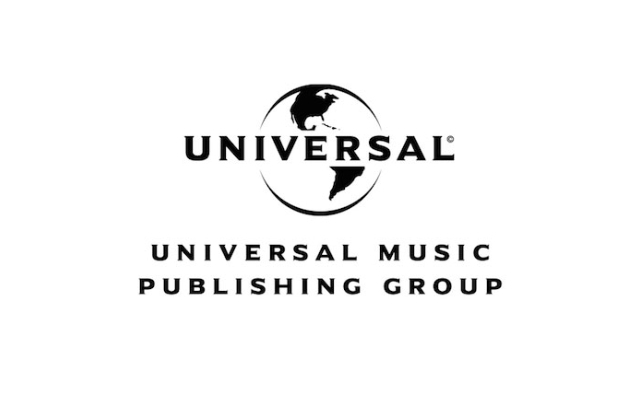 Universal Music Publishing (UMPG) had a particularly strong six-months, with H1 revenues up 11.1% year-on-year to €409m ($495m). Total group EBITA profit stood at €326m ($395m) – a jump of 23.5% year-on-year.